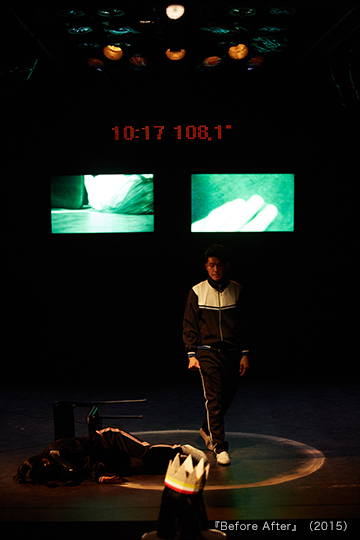 Kyung-Sung Lee founded Creative VaQi in 2007 and works as artistic director. Past works include “The Dream Of Sancho”, “The History Of Gangnam” and the “Theatre Practice” series, the most recent of which was performed in Seoul. He won a prize at the Chuncheon International Festival in 2009 and in the same year was awarded the prestigious Korea New Conception Theatre Award for ”Let Us Move Your Sofa” and Doosan Artist Award for “Namsan Documenta”. He is a director with exceptional ability who utilizes a diverse range of sensory stage language to convey the problems that confront modern day society. He engages in genre-deconstructing, multimedia experiments and reduces our dependence on text. In 2015, He was also appointed as an artistic director of 18th Seoul Marginal Theatre Festival.